Urban environment influences the way people live and shape their everyday lives, and microclimate sensitive design can enhance the use of urban public spaces. 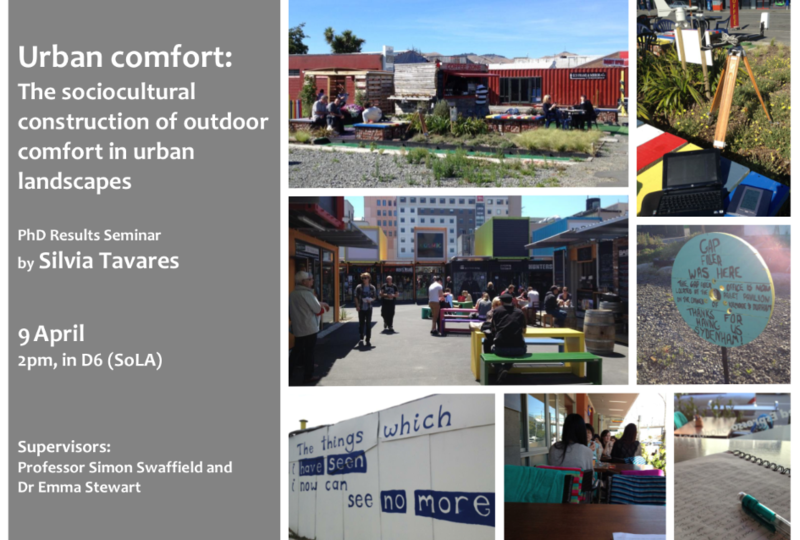 In this research I investigated the relationship between microclimate and urban culture in Christchurch based upon the concept of urban comfort. I explored the relationships between culture and environment to help understand the local requirements for urban landscape design. Innovative approaches to urban microclimate design will become more important as the world’s population becomes even more urban, and climate change generates more variability extremes in urban conditions. However, established methods of investigation based upon conventions drawn from building services research and framed by physiological concepts of thermal comfort may fail to capture the social dynamics of urban activity and their interrelationship with microclimate. A main methodological challenge in this research was to investigate urban comfort in a city undergoing rapid physical change following a series of major earthquakes (2010-2012), and that also has a strongly seasonal climate which accentuates microclimatic variability. The field investigation had to be suitable for rapidly changing settings as buildings were demolished and rebuilt, and be able to capture data relevant to a cycle of seasons. An interpretive, integrative and adaptive research strategy that combined qualitative social science methods with biophysical measures was adopted. The results are based upon participant observation, 86 in-depth interviews with Christchurch residents and microclimate data measurements. The interviews were carried out in a variety of urban settings including: established sites (places sustaining relatively little damage) and emerging sites (those requiring rebuilding) during 2011-2013. Field data suggested that the strong connections between urban and rural settings present in Christchurch’s culture, lifestyle and landscape generate a particular aesthetic and recreation preference for urban spaces, which should be considered in urban landscape design strategies. In this presentation, I outline the results of the research and draw out the implications for theory, methodology and design related to microclimate and urban comfort.